Shoe phone! Adidas has introduced a cell phone that looks like a pair of Adidas sneakers. 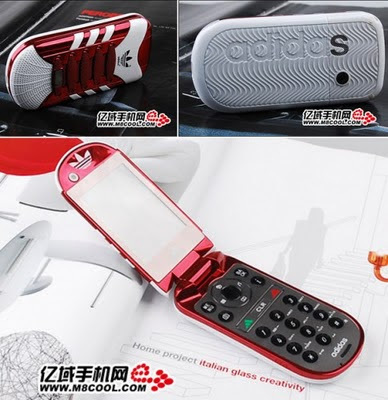 This clamshell phone might be a little outdated featurewise but stylewise it’s gimmicky cool. Sure they could have accomplished basically the same thing using just a case but what’s the fun in that (not to mention the branding opportunities inside the phone)? I like the shoe tread bottom. You’re not going to buy it but it’s $80 just in case you’re interested. And you know it’s the phone Run-DMC would use.